Sew la Tea: Nano, chapter 1. 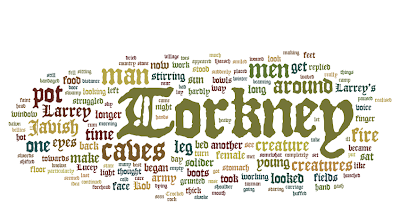 I'm at 2200 words, partway through chpt 1 and I thought I'd share with you two of my Wordle pictures of what I've written so far. If you are wondering what 'Torkney' is, he is the grandfather of the triplets on their Mother's side! All will make sense soon I promise! I'm a bit behind so I'm going to type furiously today!